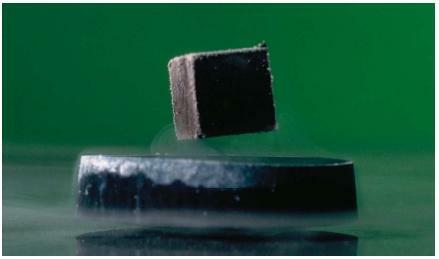 A superconductor is a material that exhibits no resistance to the flow of an electric current. Once a flow of electrons is started in such a material, that flow continues essentially forever. Superconductivity is an unheard-of property in materials at or near room temperatures. All substances that conduct an electric current—copper, silver, and aluminum are among the best conductors—exhibit at least some resistance to the flow of electrons. This resistance is somewhat similar to the friction that one observes in sliding a smooth wooden block across a smooth wooden floor. Resistance is, in most cases, an undesirable property for conductors. When an electric current is passed through a wire, for example, some of the energy represented by that current is wasted in overcoming the resistance of the wire. Only a fraction, even if it is a large fraction, of the energy can actually be put to useful work. Superconducting materials have the potential for revolutionizing electrical devices. Since they do not resist the flow of an electric current, all the energy represented by that flow can be used for practical purposes. The story of the development of superconducting materials is an especially interesting one. Superconductivity was first discovered by Dutch physicist Heike Kamerlingh Onnes (1853–1926) in 1911. While studying the properties of materials near absolute zero (0 K, −273°C, or −459°F), Kamerlingh Onnes found that some materials lose all resistance to the flow of electric current at these temperatures. Absolute zero: The temperature at which all atomic and molecular motion ceases. Absolute zero is about 0 K (Kelvin), −273°C, or −459°F. Cryogenics: The production of very low temperatures and the study of the properties of materials at those temperatures. Electrical resistance: The property of a material that opposes the flow of an electric current. Electromagnetism: A form of magnetic energy produced by the flow of an electric current through a metal core. Particle accelerator: A device for accelerating subatomic particles to very high speeds for the purpose of studying the properties of matter at very high energies. Kamerlingh Onnes's discovery was, for more than 70 years, a subject of purely theoretical interest. As useful as superconducting materials would be in the everyday world, no one was able to find a way to produce that effect at temperatures much above absolute zero. Then, in 1986, a remarkable breakthrough was reported. Karl Alex Müller (1927– ) and Georg Bednorz (1950– ), two physicists working at the IBM Research Division in Zurich, Switzerland, found a material that becomes superconducting at a temperature of 35 K (−238°C). Within an amazingly short period of time, news of other high-temperature super-conducting materials had been announced. In 1987, for example, a team led by Chinese-American physicist Paul Ching-Wu Chu announced the discovery of a material that becomes superconducting at a temperature of 92 K (−181°C). Shortly thereafter, materials with superconducting temperatures as high as 150 K (−123°C) also were announced. It may seem strange to call a temperature of 92 K a high temperature. The reason for that choice of terms is that the liquid most commonly used for cryogenic (low temperature) research is liquid nitrogen, with a boiling point of 77 K. The technology for making and storing liquid nitrogen is now well advanced. Many industrial operations can be conducted quite easily at temperatures this low. superconductivity from one of theoretical interest to one that could be applied to practical electrical problems. The applications for superconducting materials fall into two general categories: electronics and magnets. All electronic devices will operate more efficiently if they are made from superconducting materials rather than from ordinary conducting materials. However, given the fact that those materials have to be kept at the temperature of liquid nitrogen, those applications have only a limited commercial application so far. The situation is very different with magnets. The most powerful magnets are electromagnets—magnets that owe their magnetic properties to the flow of electric current through a metal core. The traditional way to make a more powerful magnet is to make the metal core larger and larger. The problem with this approach, however, is that the core needed to make very powerful magnets is larger than can be used on a practical basis. Using superconducting materials, however, the flow of electric current is more efficient, and a more powerful magnet can be made with a smaller metal core. Perhaps the most famous application of superconducting magnets was the Superconducting Super Collider (SSC). The SSC was a machine designed to be used as a particle accelerator, or atom-smasher, an instrument to be used for the study of subatomic particles (particles smaller than an atom). The U.S. Congress approved the construction of the SSC in 1987 and funded the early stages of its construction. Seven years later, Congress canceled the project because of its escalating costs. The only reason the SSC was practical at all, however, was that the enormous magnets it needed for its operation could be made from superconducting materials. it something worth thanking you guys for. though I'm young physicist with research interest in superconductivity and solid state in general. Reading interest in non fiction; found Conquest of Cold Zero Kelvin very interesting. Have looked for more info on net & not able to find much. NASA just put up 2/11/2011 results of Atlas rocket with SunDo aboard passage through water in air produced crystal 6 sided plate with 8-12 Degree axial spin (similar to lithium 6 motivated to spin by green light laser). So we now have superconducting, superfluidity, super diamagnetism, and super halo spin, all aspects of 0 Kelvin in different materials, solids, liquids, gases and the last water in the air. Which seems to be the basis for the idea that neutron stars have icy centers. I had the privilege starting around the mid 1980s to work for a company who performed electron beam welding on the superconductor while still in the billet stage before wire extrusion. All the while before the welding process, the copper billet(s) had to be kept in a vacuum to keep the niobium rods that were assembled inside from oxidizing. From what I understand, the Supercollider was to be built in Texas, but was shot down by Congress while I was working there. Supposedly, Scotland and other countries were going to put to use our technology. To this day, in 2011, the billets still roll through the production line 24/7.